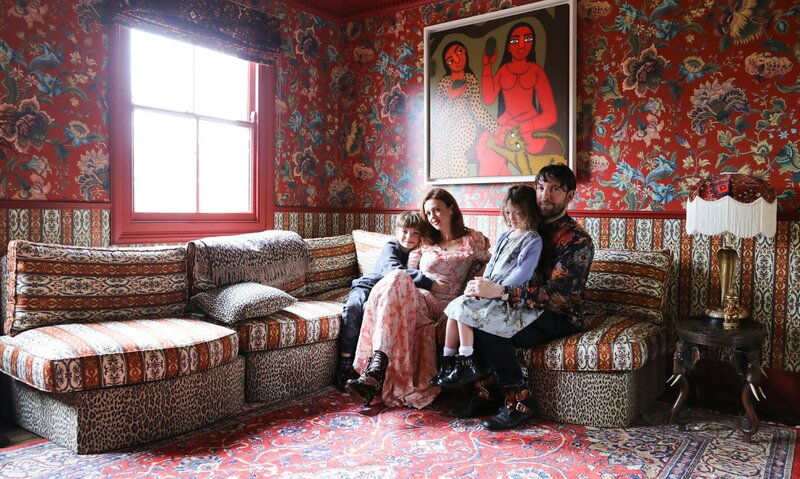 They have that irreverent style that characterises the designs of House of Hackney, the interior design brand that specialises in prints, colours and textures, which was founded 8 years ago around their kitchen table. Frieda Gormley and Javvy M Royle look like characters from the illustrations of a children’s book. 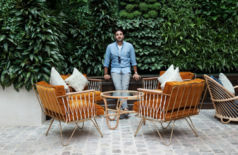 This is the first time, since the opening of their Shoreditch store and the beginning of the renovation of their home, that the couple have opened the doors of the latter to journalists. A massive project that required the intervention of MRA Architecture & Interior Design. A first that’s worth going out of your way to see. The world of House of Hackney – exclusively distributed in France by Lelièvre Paris – is a journey in itself. A journey to the heart of the Victorian origins of this townhouse located near London Fields Park – in the fabulous London Borough of Hackney – that gave its name to the brand. Following a ground-floor extension inspired by a glasshouse, the walls now feature Moroccan-style arches. Flights of fancy maximise the space that evokes the palm houses of the nineteenth century that are so typical of this part of London. As for the rest, Frieda Gormley and Javvy M Royle trusted their instincts. And they did right. 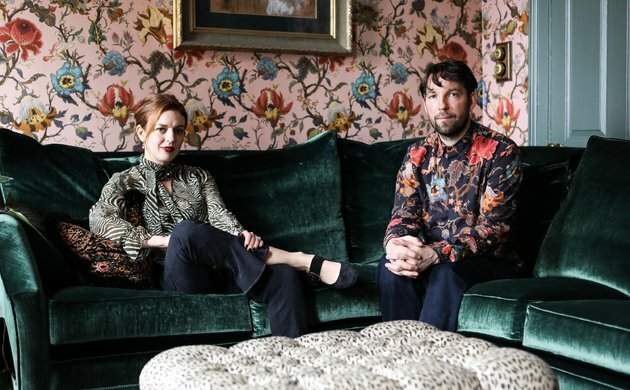 Armed with their respective experience in fashion and the world of art, the founders of House of Hackney have succeeded in rewriting the rules of the decoratively correct by introducing beauty and humour to their interior. A blend of tradition and modernity with a unique and, above all, surprising design. Subversively beautiful and often irreverent, we pride ourselves in unexpected and unique design. Frieda, Javvy: can you tell us who you are? How did you get to where you are today? 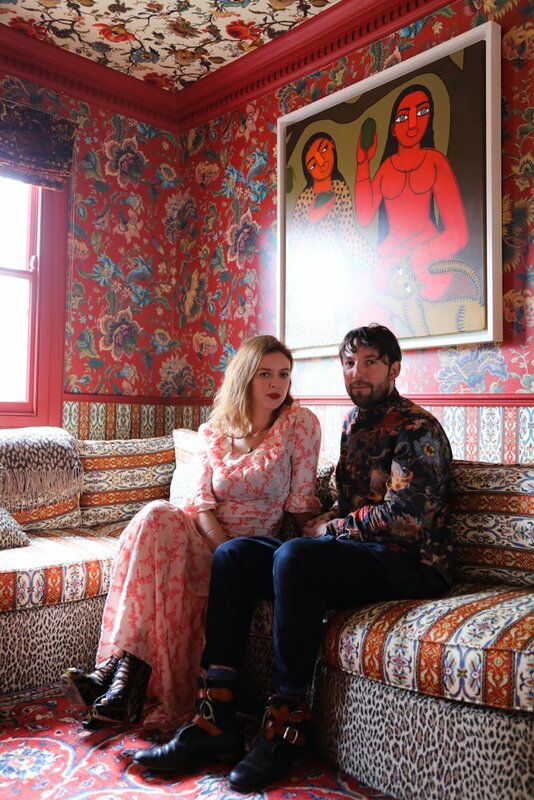 With backgrounds in product design and fashion, my husband Javvy and I started House of Hackney in 2011 around our kitchen table. When we were unable to find the interiors we wanted for our London Fields home – everything out there was very ‘beige’ and we were looking to bring print and colour into the house – we recognised a gap in the market to create an interiors brand that would have print at the heart of it. Luckily the world seemed to want the same and in the 8 years since we have been on an adventure of bringing print and colour into people’s homes. Where does the House of Hackney name come from? We’ve lived in Hackney since 2005 and the area holds a very special place in our hearts. Our home, located just off London Fields, was the original House of Hackney where we showcased our very first collections including Hackney Empire and Dalston Rose. We are always looking for inspiration from our local environs so it felt natural to have Hackney in the name. When we first launched the brand, there was no manual on how to do it so we wrote it ourselves, searching the country for the best craftsmen in each of their fields in order to deliver designs that were beautifully made while supporting UK businesses in the process. Our sofas are all made by a family firm in Long Eaton; the jacquards are woven in Suffolk; and the bone china comes from Stoke-on-Trent. How would you define its spirit? House of Hackney champions print, colour and texture, taking its inspiration from traditional interior design while making a contemporary statement. Subversively beautiful and often irreverent, we pride ourselves in unexpected and unique design. Could you tell us about this house? We bought our Victorian townhouse, located next to London Fields, in 2007. Originally it was divided up into bedsits, so we quickly stripped it back, painting everything white and putting down parquet flooring. 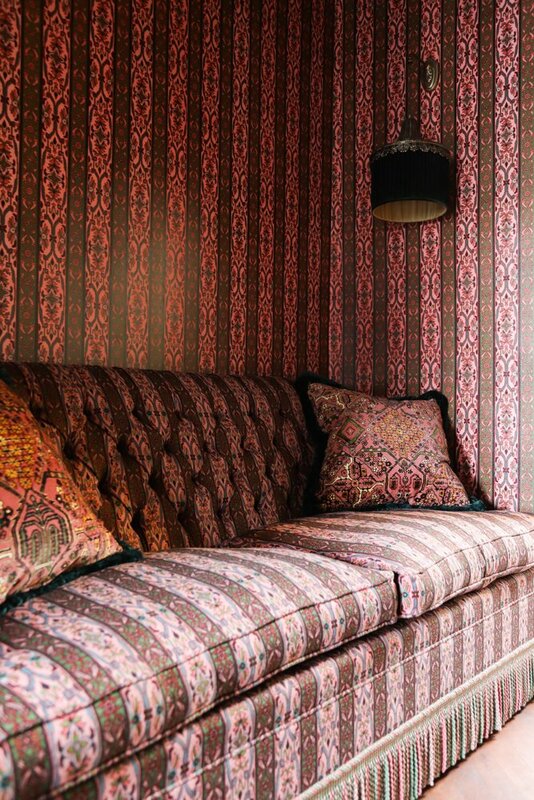 Soon after, we began craving colour and texture which is when we launched House of Hackney. The house became our temporary showroom, displaying the Hackney Empire, Dalston Rose and Queen Bee prints. These designs had a Victorian feel, inspired by the roots of the house. As we grew the brand and opened our Shoreditch store, we closed the doors to the house until now following a major renovation. 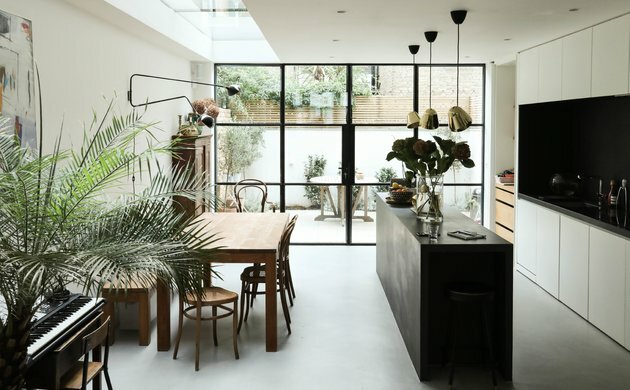 We worked with architects to maximise space and light – the redesign includes a ground floor extension which takes inspiration from a Victorian greenhouse and central walls have been knocked into Moroccan-style arches to create an improved flow of space. We have named the home Loddiges in homage to the historical palm house that resided in Hackney during the 1800s. Loddiges would have been there at about the same time as the house was built so there is this linked history to palms and to exotic plants which obviously very much inspire our designs. Pink Artemis wallpaper with floral pattern. Material : silk, cotton, velvet. Dimensions : 240 x 240 x 100 cm. 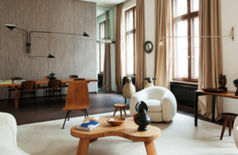 Did you have anything in particular in mind, in terms of the décor? It was very instinctual, we just chose the wallpapers, fabrics and prints that we love and that we gravitated towards. Although there is a lot of colour in the house, we subliminally went for a lot of tonal colour inspired by the clay pinks and greens of nature. You can’t go wrong by staying close to nature in terms of inspirations. We saw this as an opportunity to really play and break boundaries – to inject beauty and humour into our home. For example, for the first time we played with wallpaper on ceilings to create a mesmeric effect. We chose favourite prints from previous collections as well as a few new prints from our upcoming autumn collection created in association with the historical French interiors house, Zuber. Why did you choose to live in this part of Hackney? What are your favourite parts about living there? We feel so privileged to live where we do. The area was built in Victorian times and our house sits on a street off London Fields park, which has its own 30m outdoor lido and the best bakery in London, E5 Bakehouse. It is an amazing, creative and multicultural area and we feel so lucky to live in such a progressive and diverse neighbourhood. 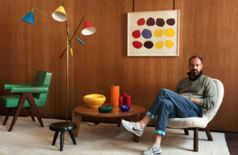 Do you have a favourite era, artist, or designer? 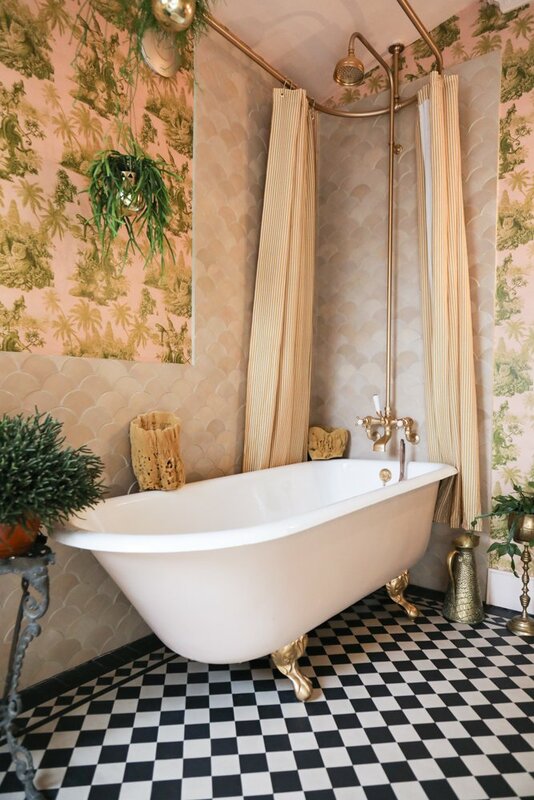 We are very inspired by The Aesthetic Movement and 18th century interiors by William Morris as well as various other interior designers such as Madeleine Castaing, Billy Baldwin and Bill Willis. Inspiration could be a lady walking down the street in a wonderfully coloured coat! Inspiration for collections can come from everywhere and anywhere. We are hugely influenced by nature, as well as our local environs, music, cinema and travel. It could be a lady walking down the street in a wonderfully coloured coat! We keep our antennae on and inspiration can be found when least expected. Is carefully maintained interior design compatible with a family life? 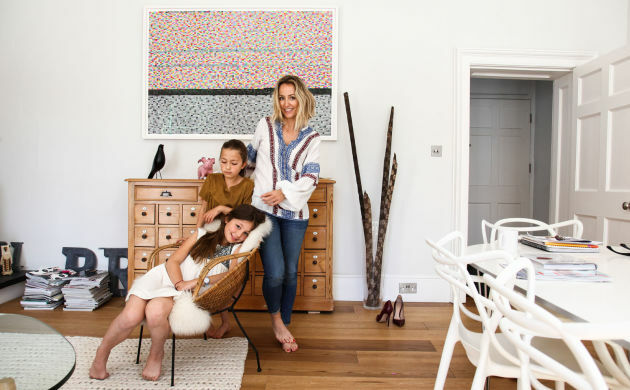 Yes, when renovating the house, the most important thing was that the end result would be a family home that had our personalities stamped all over it – a home that wasn’t precious, that the children could feel free to enjoy, that would feel like a creative hub filled with books and colour and art. Where might we bump into you in London? London Fields Park, E5 Bakehouse, Lardo restaurant, The Victoria and Albert Museum and the incredible Moth Club on a Saturday night! A Stay in London with the Co-Founder of Vestiaire Collective. Such a classy and refined home! 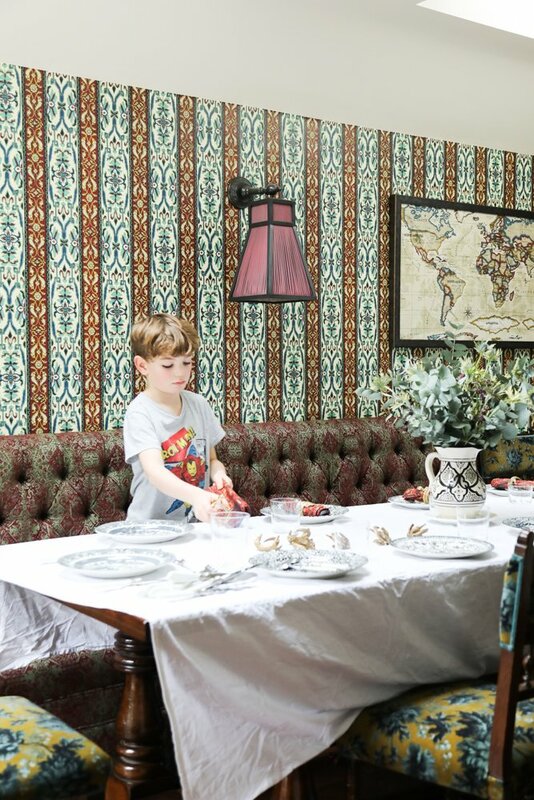 The wallpaper is especially lovely, and the family’s wardrobe delightful! Thank you for sharing.